Linkin Park: "Our fans never know what to expect from us"
Linkin Park talked about its upcoming Rock in Rio live show. The boys of Linkin Park who will perform in the Rock in Rio festival in May, say always looking to do something original. 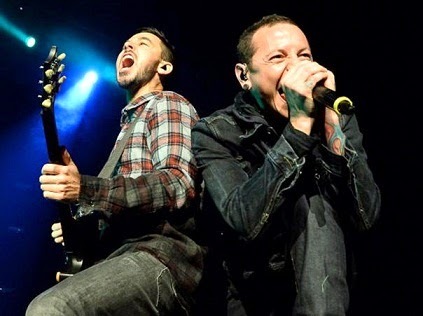 Linkin Park will be one of the main attractions of the first edition of Rock in Rio festival in the US, which will take place the second and third weekend in May in Las Vegas (Nevada) by 15th anniversary of the launch of the band’s first album "Hybrid Theory." "We were very young, but that record has stood the test of time," he said in an interview with Efe Brad Delson, guitarist of training. "We are very proud of that job, so I'll celebrate when the time comes," he said. "Hybrid Theory," which included songs like "In the end" or "Crawling", was released on October 24, 2000 and sold more than 10 million units in the US After that milestone, followed by "Meteora" (2003), "Minutes to Midnight" (2007), "A Thousand Suns" (2010), "Living Things" (2012) and "The Hunting Party" (2014). "Every time we entered a recording studio we have the opportunity to do something completely new," Delson said. "We never want to repeat. Always looking for a new challenge, do something original. Our fans have to keep an open mind because you never know what to expect from us. Luckily, they stay with us on this trip. Our commitment is to do something honest and true whenever we recorded. " Linkin Park will lead the first weekend of the Rock in Rio in Las Vegas, entirely dedicated to rock bands like No Doubt, Mana, Foster the People, Metallica, Rise Against, Deftones and Sepultura. The Californian band has previous experience in Rock in Rio - present in the editions of 2008, 2012 and 2014 in Lisbon, and Delson recognizes that one of his favorite festivals.